One of my courses this fall, Rare Books and Special Collections Librarianship, was a half semester course that just ended. I enjoy having some extra time during the week, but I miss the class. We met in the the University of Illinois Rare Book & Manuscript Library and had the opportunity to view items like Shakespeare's First Folio, Beatrix Potter early editions, and even the first few versions of the Blade Runner screenplay. (Trivia: The term "replicant" only appears in later drafts). Aside from observing neat old documents, I also learned a lot about special collections security issues, preservation, and acquisitions. 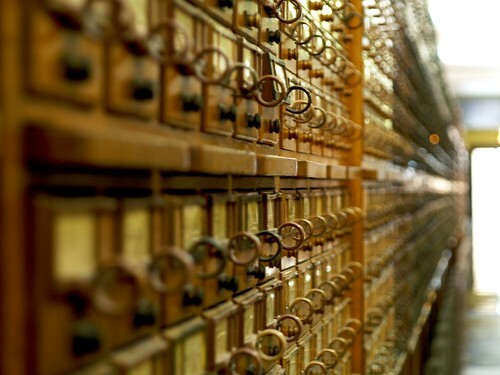 One of the other perks was enjoying the vast halls of old card catalogs in the main library building. 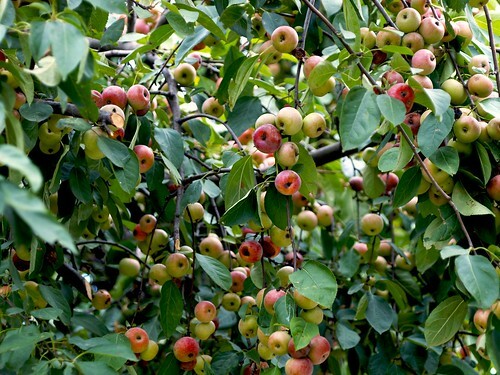 Chicago news reports sounded the alarm last week that orchards are running out of apples. We have plenty down in central Illinois. 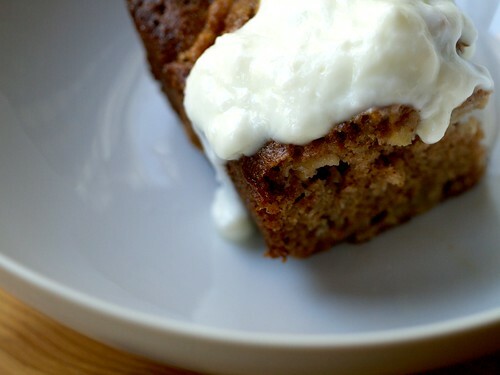 If you are able to get your hands on some, I suggest you bake this apple cake some evening this week. It is even better the day after it bakes and it makes a wonderful breakfast with a dollop of plain yogurt. I followed this recipe from sixoneseven, though I reduced the sugars to half a cup each of white and brown and I omitted the glaze. It's been nearly three weeks, and I am slowly adjusting to my new life as a graduate student in Champaign, Illinois. As I write this, a magnificent Midwestern thunderstorm is rolling over the prairie and into town, reminding me that there is much more to this great state than I often acknowledge, and that I am lucky to be able to experience it. I feel sad about the life I left behind in Chicago, disappointed that I am behind on personal projects as the summer nears an end, and apprehensive about finding my place in this new town alone. At the same time, it is exciting that the unfamiliar faces I met two weeks ago are becoming classmates, colleagues and - slowly - friends. My courses and my assistantship are interesting, and I have enthusiasm for the projects I will be working on this year. As I explore my neighborhood, I've been astonished at the number of apple trees and patches of wild lavender I've found. I am adapting to the infrequent public transit and I've happily found some wonderful Asian food markets and an adequate generic grocery store within easy walking distance. I live in an actual house for the first time since I left my parent's home ten years ago and my roommates are lovely. A series of weddings and family reunions has had me traveling every weekend recently, but I am looking forward to a Saturday trip to Mirabelle Bakery and the farmers market next weekend. During times of transition, a good meal can provide great comfort. 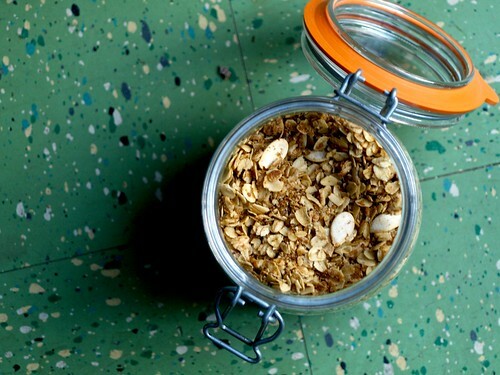 The first thing I baked in my new home was a batch of this simple granola. Paired with thick yogurt and a pinch of coarse sea salt for breakfast, my mornings feel a bit calmer. Preheat oven to 300F. Mix all ingredients in a large bowl, except the raisins. Pour mixture onto a heavy baking sheet in an even layer and bake for 45 minutes, stirring every 10 minutes. Stir just enough to ensure the granola won’t burn. When well-toasted and fragrant, remove from the oven and allow to cool. Mix in the raisins and store in an air-tight container. I have some big news! After several years in nonprofit development, I am leaving my job at the end of this month for graduate school. I'll be moving to Champaign, Illinois and attending the University of Illinois Graduate School of Library and Information Science. I am really looking forward to this opportunity, but I'm a bit nervous about uprooting my life. I've learned a lot in my current position, but I'd be lying if I didn't admit that I am very ready to move on. I am really proud of the work our two-person department has been able to achieve with virtually no resources -- in fact, I'm astounded when I sit back and reflect on our accomplishments. I truly wish the agency the best in the future, but I am really ready for a change and a more positive environment. Purchasing a bike to use in a city without scary traffic. Spending time with my friends Andy and Sarah. Having access to a nice gym. The Blind Pig, Mirabelle Bakery and Prairie Fruits Farm. 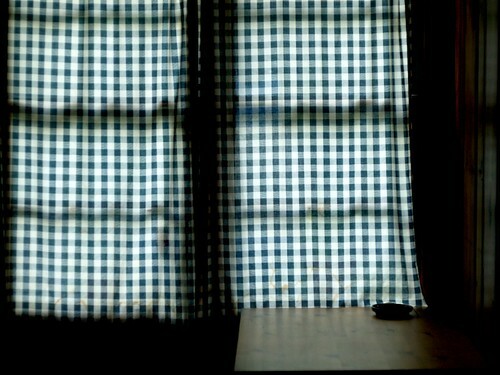 Getting to know my two new roommates, Greg and Michelle, and having my own room. I am also ecstatic that I earned a Graduate Assistantship! This position will provide me with work experience, cover my tuition, and earn me a small monthly income. The work sounds like a great fit for me -- a cross between my interest in food and my interest in information collection and organization. I'll be employed by the Agricultural Communications Documentation Center. The collection includes current and historical communications related to agriculture, food, natural resources and rural affairs. I'll be working to build and manage this collection, further customize the relational databases, improve the website, and put in a few hours a week at the library reference desk. I'm not sure how many of you will make it all the way through that long post, but thank you for letting me share it with you. 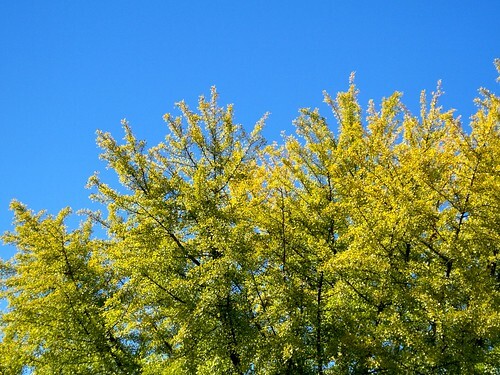 Please let me know if you have any favorite places in the area that I should check out (though, I am without a car) -- or if you are in the area, email me (underneath my photo) and we can plan a picnic! I am also interest in getting to know more men and women in the library field, so don't hesitate to send me a note if you would like to start a conversation about the profession. Now, on to the delicious stuff. 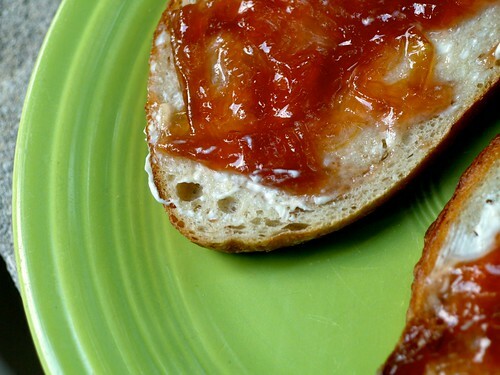 My favorite rhubarb recipe of the season is this very simple "refrigerator" jam. 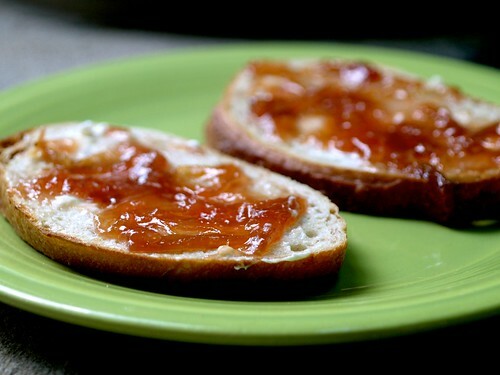 This jam is prepared without pectin and is not canned, but rather stored in the refrigerator for up to two weeks. The ginger in this recipe balances the sugar quite nicely. Jam is usually too sweet for me on its own, but I love a few spoonfuls of this spread over toasted sourdough with cream cheese, or served warm over ice cream. Combine all the ingredients in a heavy-bottomed saucepan over medium-high heat. Bring the mixture to a boil and stir until the sugar dissolves. Reduce the heat to medium and simmer for 20 to 30 minutes, stirring frequently, until the mixture achieves your desired thickness (keeping in mind that it will be a bit thicker once it cools). Remove the ginger root and transfer to a clean jar -- I used a squat glass, swing-top jar with a wide mouth-- and allow to cool at room temperature before covering. Store in the refrigerator for up to two weeks.